This spread was done for a woman who recently divorced her spouse. At a glance, notice that all four elements are present. Though divorce is a major life stress, this woman has a healthy balance of energy distributed between Body/Earth (DESCENT), Mind/Air (WISDOM), Spirit or Action/Fire (LIBERATION), and Heart/Water (PRAYER). When all four elements are present, the focus of the reading is on the specific meaning of each card. 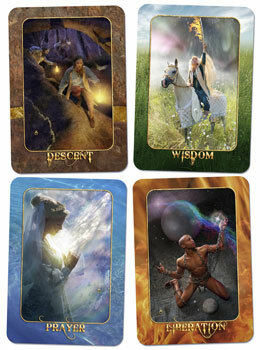 The DESCENT card shows a loss of material possessions, a downsizing and change in economic circumstance and lifestyle. There is no quick “treasure chest” to be had. Instead, the seam of gold in the artwork indicates newfound wealth from the experience. Also, the divorcée gains flexibility and freedom over how her assets will be used now that she can decide as a single person without having to consider her Ex. The WISDOM card indicates strong self-esteem and solid thought patterns that work for her. The four legs of the horse represent the power of her healthy thoughts. The same mental assets that initiated the divorce will now carry her through her new, separate life. The LIBERATION card suggests freedom from old limitations. This card is in the Spirit and Action element of Fire. Consequently, the woman will be able to move forward with goals and projects closer to her spiritual calling, without restrictions formerly imposed by her Ex. Finally, the PRAYER card indicates that daily heartfelt spiritual seeking will help her transition emotionally. This woman already has a strong prayer and meditation practice, so the card reminds her to turn to this spiritual oasis for strength, encouragement, and relief.